Regulation (EC) No 999/2001 lays down rules for the prevention, control and eradication of transmissible spongiform encephalopathies (TSEs) in bovine, ovine and caprine animals. It applies to the production and placing on the market of live animals and products of animal origin and in certain specific cases to exports thereof. Article 7(1) of Regulation (EC) No 999/2001 prohibits the feeding to ruminants of protein derived from animals. Article 7(2) of that Regulation extends that prohibition to animals other than ruminants and restricts that prohibition, as regards the feeding of those animals with products of animal origin, in accordance with Annex IV to that Regulation. Annex IV to Regulation (EC) No 999/2001 extends the prohibition provided for in Article 7(1) to the feeding to non-ruminant farmed animals, with the exception of the feeding to carnivorous fur producing animals, of, inter alia, processed animal protein. However, by way of derogation and under specific conditions, point (c) of Chapter II of Annex IV authorises the feeding of non-ruminant processed animal protein to aquaculture animals only, provided that the processed animal protein and compound feed containing such protein have been produced in compliance with Section D of Chapter IV of Annex IV to Regulation (EC) No 999/2001. This Section currently requires that the animal by-products used for the production of such processed animal protein be derived from slaughterhouses or cutting plants. Given the production process of processed animal protein derived from insects, this requirement cannot be met in the case of insects. As a result, the use of processed animal protein derived from insects in feed for aquaculture animals is currently not allowed. In several Member States, the rearing of insects for the production of processed animal protein derived from them and other insect derivatives destined for petfood has started. This production is carried out under the national control schemes of the competent authorities of the Member States. Studies have shown that farmed insects could represent an alternative and sustainable solution to conventional sources of animal proteins destined for feed for non-ruminant farmed animals. On 8 October 2015, the EFSA (European Food Safety Authority) published a scientific opinion on a risk profile related to the production and consumption of insects as food and feed (3). As regards the risks related to the presence of prions, EFSA concludes that, compared to the occurrence of hazards in currently authorised protein sources of animal origin, the occurrence of hazards in non-processed insects is expected to be equal or lower, as long as the insects are fed on substrates that do not harbour material of ruminant or human (manure) origin. As the processing of insects may further reduce the occurrence of biological hazards, that statement is also valid when it comes to processed animal proteins derived from insects. As per the definition of ‘farmed animals’ laid down in Article 3(6) of Regulation (EC) No 1069/2009, insects bred for the production of processed animal protein derived from insects are to be considered as farmed animals, and are therefore subject to the feed ban rules laid down in Article 7 and Annex IV to Regulation (EC) No 999/2001 as well as to the rules of animal feeding laid down in Regulation (EC) No 1069/2009. Thus, the use of ruminant proteins, catering waste, meat-and-bone meal and manure as a feed for insects is prohibited. Furthermore, in accordance with Annex III to Regulation (EC) No 767/2009 of the European Parliament and of the Council (4), the use of faeces for animal nutritional purposes is prohibited. Processed animal protein derived from insects and compound feed containing such processed animal protein should therefore be authorised for feeding aquaculture animals. Point (c) of Chapter II of Annex IV to Regulation (EC) No 999/2001 should therefore be modified accordingly and a Section laying down TSE related conditions for the production of processed animal protein derived from farmed insects and compound feed containing such protein should be added in Chapter IV of Annex IV to that Regulation. By analogy with what is already applicable for processed animal protein derived from non-ruminant animals and compound feed containing such protein destined for feeding aquaculture animals, specific conditions for the production and use of processed animal protein derived from insects should be laid down in order to avoid any risk of cross-contamination with other proteins which could pose a TSE risk to ruminant animals. In particular, by analogy with the conditions laid down in Section A of Chapter IV of Annex IV to Regulation (EC) No 999/2001, processed animal protein derived from insects should be produced in plants dedicated exclusively to the production of products derived from farmed insects. In addition, in the interest of legal certainty, it is appropriate to insert a definition of farmed insects in Annex I to Regulation (EC) No 999/2001. Annexes I and IV to Regulation (EC) No 999/2001 should therefore be amended accordingly. Annex X to Commission Regulation (EU) No 142/2011 (5) lays down rules for implementing Regulation (EC) No 1069/2009, including parameters for the production of safe feed of animal origin intended for feeding farmed animals. Only animal by-products and derived products complying with the requirements of Annex X to Regulation (EU) No 142/2011 may be fed to farmed animals, other than fur animals. While the provisions set out in Annex X to that Regulation do not cover live insects and dried insects in feed for farmed animals, the use of dried insects in or as pet food is subject to the provisions set out in Annex XIII to the aforementioned Regulation. The amendment to Regulation (EC) No 999/2001 with a view to authorise processed animal protein derived from insects for feeding aquaculture animals is likely to open the opportunity for bigger production of processed animal protein derived from insects in the Union. Whereas the current small scale rearing of insects for petfood can adequately be addressed by existing national control schemes, Union provisions addressing animal health, public health, plant health or environmental risks are appropriate to ensure that insect rearing within the Union on a larger scale is safe. With respect to the insect species reared in the Union, these should not be pathogenic or have other adverse effects on plant, animal or human health; they should not be recognised as vectors of human, animal or plant pathogens and they should not be protected or defined as invasive alien species. Taking into account these national risk assessments, as well as the EFSA opinion of 8 October 2015, the following insect species can be identified as those insect species currently reared in the Union which fulfil the abovementioned safety conditions for insect production for feed use: Black Soldier Fly (Hermetia illucens), Common Housefly (Musca domestica), Yellow Mealworm (Tenebrio molitor), Lesser Mealworm (Alphitobius diaperinus), House cricket (Acheta domesticus), Banded cricket (Gryllodes sigillatus) and Field Cricket (Gryllus assimilis). Annex X to Regulation (EU) No 142/2011 should therefore be amended to add, in Section 1 of its Chapter II, a list of insect species which may be used for the production of processed animal protein obtained from farmed insects. This list should include the abovementioned insect species and may be amended in the future based on an assessment of the risks posed by the insect species concerned to animal health, public health, plant health or the environment. Annex XIV to Regulation (EU) No 142/2011 sets out requirements for the import of animal by-products and derived products from third countries. Safety requirements applicable for growing insects intended to be used in feed for aquaculture animals and for the placing on the market of processed animal proteins derived from those insects, in particular as regards the insect species which may be used and the feed which may be given to the insects, should apply also in the case of imports from third countries. Sections 1 and 2 of Chapter I of Annex XIV to Regulation (EU) No 142/2011 should therefore be amended to lay down those requirements for imports into the Union. Annex XV to Regulation (EU) No 142/2011 lays down model health certificates for the import into the Union of animal by-products. The model health certificate set out in Chapter 1 of Annex XV to that Regulation applies to imports into the Union of processed animal protein. For the purpose of imports of processed animal protein derived from farmed insects, a new model health certificate should be laid down and should include the specific requirements for breeding of farmed insects for the production of processed animal protein mentioned in Annex XIV to Regulation (EU) No 142/2011, as well as the other relevant requirements for imports of processed animal protein. Therefore new model of health certificate for the import of processed animal protein derived from farmed insects should be inserted into Chapter 1 of Annex XV. Furthermore, the new model health certificate inserted in Chapter 1 of Annex XV to Regulation (EU) No 142/2011 should also take into account the amendment by Commission Regulation (EU) 2016/1396 (6) of the requirements related to TSE applicable to imports of animal by-products and derived products of bovine, ovine or caprine origin, as set out in Chapter D of Annex IX to Regulation (EC) No 999/2001. Annexes X, XIV and XV to Regulation (EU) No 142/2011 should therefore be amended accordingly. 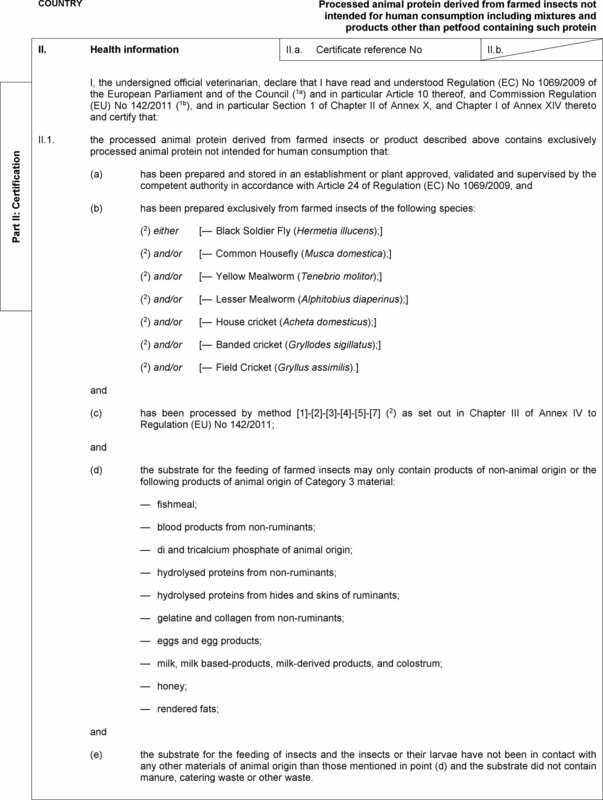 Section A of Chapter III of Annex IV to Regulation (EC) No 999/2001 lays down requirements to prevent cross-contamination during transport in bulk between, on the one hand, fishmeal, dicalcium and tricalcium phosphate of animal origin, blood products derived from non-ruminants as well as compound feed containing these products, which are intended for feeding non-ruminant farmed animals, and, on the other hand, feed intended for ruminants. Considering that a similar risk of cross-contamination exists when those materials are stored in bulk, the requirements of Section A of Chapter III of Annex IV to Regulation (EC) No 999/2001 should be extended to cover the storage in bulk of fishmeal, dicalcium and tricalcium phosphate of animal origin, blood products derived from non-ruminants and compound feed containing these materials. Section B of Chapter V of Annex IV to Regulation (EC) No 999/2001 lays down requirements to prevent cross-contamination during transport between, on the one hand, bulk feed materials and bulk compound feed containing products derived from ruminants other than milk and milk based products, dicalcium and tricalcium phosphate of animal origin and hydrolysed proteins derived from ruminant hides and skins, and, on the other hand, feed intended for farmed animals other than fur animals. Considering that a similar risk of cross contamination exists when those materials are stored in bulk, the requirements of Section B of Chapter V of Annex IV to Regulation (EC) No 999/2001, should be extended to cover the storage in bulk of feed materials and compound feed containing products derived from ruminants other than milk and milk based products, dicalcium and tricalcium phosphate of animal origin and hydrolysed proteins derived from ruminant hides and skins. Point (a) of Section D of Chapter IV of Annex IV to Regulation (EC) No 999/2001 requires that animal by-products used for the production of processed animal protein, other than fishmeal, derived from non-ruminants and intended to be used in feed for aquaculture animals, are sourced in slaughterhouses which do not slaughter ruminants and cutting plants which do not bone or cut up ruminant meat. Point (a) provides for a derogation from that requirement for slaughterhouses which carry out effective measures in order to prevent cross-contamination between ruminant and non-ruminants by-products and which are inspected and authorised on that basis by the competent authority. In order to allow for more possibilities in the types of raw materials used for the production of non-ruminant processed animal protein destined for use in feed for aquaculture animals or destined for export, it is appropriate to amend point (a) of Section D of Chapter IV of Annex IV to Regulation (EC) No 999/2001 in order to allow the use of animal by-products originating from establishments other than slaughterhouses or cutting plants, provided that those other establishments are dedicated exclusively to the handling of non-ruminant materials, or are authorised by the competent authority, following an on-site inspection, based on the same channelling requirements as those provided for in the existing derogation for slaughterhouses, given that those channelling requirements provide the necessary guarantees that cross-contamination is prevented and controlled. It is also appropriate to extend to cutting plants the derogation existing for slaughterhouses, provided that the same channelling requirements are applied. Section D of Chapter IV of Annex IV to Regulation (EC) No 999/2001 should therefore be amended accordingly. Point (b) of section A of Chapter IV of Annex IV to Regulation (EC) No 999/2001 requires that the accompanying commercial document or health certificate and any packaging of fishmeal and of compound feed containing fishmeal be marked with the words ‘contains fishmeal — shall not be fed to ruminants’. However, the commercial document or health certificate referred to in Article 21(2) of Regulation (EC) No 1069/2009 is not required for compound feed. It is therefore appropriate to amend point (b) of Section A of Chapter IV of Annex IV to Regulation (EC) No 999/2001 to clarify that, for compound feed containing fishmeal, the words ‘contains fishmeal — shall not be fed to ruminants’ should only be added on the label of the compound feed. Section B, point (d) of Section C and point (e) of Section D of Chapter IV of Annex IV to Regulation (EC) No 999/2001 should also be amended in this respect. Section C of Chapter V of Annex IV to Regulation (EC) No 999/2001 prohibits the production of feed for farmed animals other than fur animals in establishments producing petfood or feed for fur animals containing ruminant products which are prohibited for use in feed for farmed animals, other than fur animals. A similar prohibition should be laid down for establishments producing petfood or feed for fur animals containing non-ruminant processed animal protein, other than fishmeal, in order to ensure the absence of cross-contamination of feed for farmed animals other than fur animals or aquaculture animals with products prohibited in such feed. Section C of Chapter V of Annex IV to Regulation (EC) No 999/2001 should therefore be amended accordingly. Point 1 of Section E of Chapter V of Annex IV to Regulation (EC) No 999/2001 prohibits the export of processed animal protein derived from ruminants. That requirement was originally intended to control the spread of Bovine Spongiform Encephalopathy (BSE) at a time when BSE was epidemic in the Union and when the Europe was the main part of the world affected by the epidemic. However, the BSE situation in the Union has improved significantly. In 2015, five cases of BSE were reported in the Union compared to 2 166 reported cases in 2001. This improvement of the BSE situation in the Union is reflected in the fact that 23 Member States are now recognised as having a negligible BSE risk status in accordance with Commission Decision 2007/453/EC (7), based on the BSE risk status recognised at international level by the World Animal Health Organisation (OIE). The prohibition on the export of processed animal protein derived from ruminants should therefore be abolished and replaced by specific conditions to be complied with, in order to reduce the burden for trade and bring more proportionality compared to the current BSE epidemiological situation. Those conditions should notably be aimed at ensuring that the exported products do not contain meat-and-bone meal, the export of which is not authorised by Article 43(3) of Regulation (EC) No 1069/2009. As meat-and-bone meal may contain specified risk materials or may be derived from animals which have died or have been killed for reasons other than slaughter for human consumption, meat-and-bone meal represents a higher BSE risk and should therefore not be exported. In order to ensure that the exported processed animal protein of ruminant origin do not contain meat-and-bone meal and are not used for other purposes than those authorised by Union legislation, the processed animal protein derived from ruminants should be transported in sealed containers directly from the processing plant to the point of exit from the Union, which should be a border inspection post listed in Annex I to Commission Decision 2009/821/EC (8), in order to permit official controls. 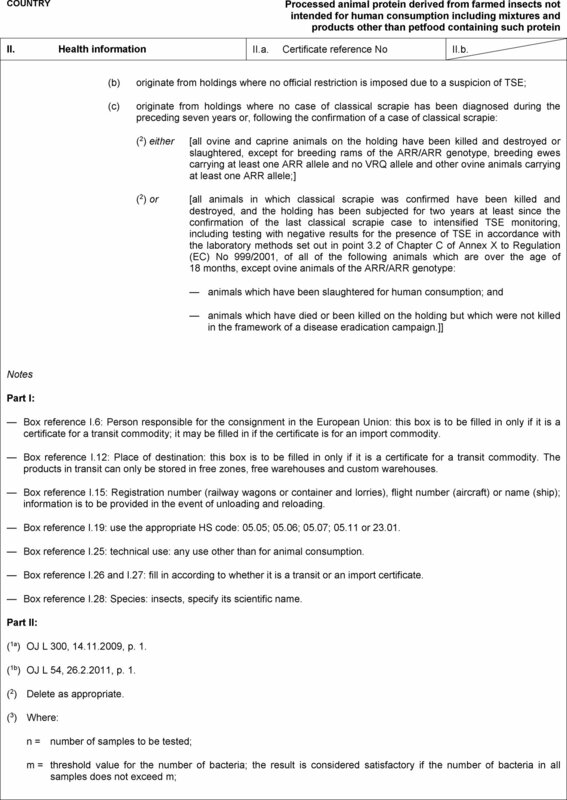 Such official controls should be carried out using the existing official control procedures, in particular the commercial document in accordance with the model established in point 6 of Chapter III of Annex VIII to Regulation (EU) No 142/2011 and the communication between competent authorities via the integrated computerised veterinary system (TRACES) introduced by Commission Decision 2004/292/EC (9). In accordance with Article 24 of Regulation (EC) No 1069/2009, the processing plant must be approved for the processing of Category 3 material and in accordance with Article 45 of that Regulation, it must be subject to regular official controls, including, where the processing plant is also approved for the processing of Category 1 and/or 2 material, as regards the permanent marking of Category 1 and 2 material required by that Regulation. Point 2 of Section E of Chapter V of Annex IV to Regulation (EC) No 999/2001 requires that compound feed containing processed animal proteins derived from non-ruminants and intended for export are produced in accordance with certain requirements, referring notably to point (e) of Section A of Chapter V of Annex IV to that Regulation, which, in turn, refers to Section D of Chapter IV of that Annex. As those cross-references have led to diverging interpretations, it is appropriate to reformulate point 2 of Section E of Chapter V of Annex IV to Regulation (EC) No 999/2001 in order to clarify the requirements applicable for the production of processed animal proteins derived from non-ruminants, or compound feed containing such proteins, intended for export from the Union. In particular, the reference, in point 2(b) of Section E of Chapter V of Annex IV to Regulation (EC) No 999/2001, which concerns exports of compound feed containing processed animal protein derived from non-ruminants, to point (d) of Section D of Chapter IV of that Annex, which concerns the production of compound feed containing processed animal protein derived from non-ruminants for feeding aquaculture animals, is not adapted to all cases. While point (d) of Section D of Chapter IV of Annex IV to Regulation (EC) No 999/2001 requires that the compound feed establishment be dedicated exclusively to the production of feed for aquaculture animals or be authorised based on measures taken to avoid cross-contamination between feed intended for aquaculture animals and feed intended for other farmed animals, in the case of exports, Annex IV to Regulation (EC) No 999/2001 does not limit the species to which the exported compound feed may be fed to in the third country. The cross-contamination to be targeted in this case is therefore between the exported compound feed containing non-ruminant processed animal protein and feed destined for other farmed animals than aquaculture animals to be placed on the Union market. Point 2 of Section E of Chapter V of Annex IV to Regulation (EC) No 999/2001 should therefore be amended accordingly. The amendments described in previous recitals concerning (1) the storage of certain feed materials and compound feed; (2) the production of processed animal protein derived from farmed insects and of compound feed containing such protein; (3) the export of compound feed containing processed animal protein derived from non-ruminants; and (4) the use of raw materials from other establishments than slaughterhouses and cutting plants for the manufacturing of non-ruminant processed animal protein, include requirements for Member States competent authority to register or authorise certain establishments based on the fulfilment of those requirements. Section A of Chapter V of Annex IV to Regulation (EC) No 999/2001 should therefore be amended in order to include the obligation for Member States to keep up-to-date and make publicly available lists of those establishments. To limit the burden for competent authorities, the publication of lists of operators should be limited only to those cases where such publication is necessary in order for operators to identify which potential suppliers comply with the requirements of Annex IV to Regulation (EC) No 999/2001, and for competent authorities to control the respect of those requirements along the production chain. Section A of Chapter V of Annex IV should therefore be amended to exclude lists of home compounders from the obligation to be made publicly available. As Member States and operators need sufficient time to adapt to the amendments made by this Regulation in Section A of Chapter III, as regards the storage of certain bulk feed materials and compound feed, and in Sections A, B and C of Chapter V of Annex IV to Regulation (EC) No 999/2001, as regards the lists of establishments producing in accordance with certain requirements of Annex IV to Regulation (EC) No 999/2001, as regards the storage of feed containing products derived from ruminants, and as regards the production of petfood containing processed animal protein derived from non-ruminants, those changes should apply from 1 January 2018. Annexes I and IV to Regulation (EC) No 999/2001 are amended in accordance with Annex I to this Regulation. Annexes X, XIV and XV to Regulation (EU) No 142/2011 are amended in accordance with Annex II to this Regulation. It shall apply from 1 July 2017.
the amendments made to Sections A, B and C of Chapter V of Annex IV to Regulation (EC) No 999/2001 by point 2(d)(i) of Annex I to this Regulation. Done at Brussels, 24 May 2017. (1) OJ L 147, 31.5.2001, p. 1. (2) OJ L 300, 14.11.2009, p. 1. (3) Scientific Opinion on a Risk profile related to production and consumption of insects as food and feed, The EFSA Journal (2015);13(10):4257. (4) Regulation (EC) No 767/2009 of the European Parliament and of the Council of 13 July 2009 on the placing on the market and use of feed, amending European Parliament and Council Regulation (EC) No 1831/2003 and repealing Council Directive 79/373/EEC, Commission Directive 80/511/EEC, Council Directives 82/471/EEC, 83/228/EEC, 93/74/EEC, 93/113/EC and 96/25/EC and Commission Decision 2004/217/EC (OJ L 229, 1.9.2009, p. 1). (5) Commission Regulation (EU) No 142/2011 of 25 February 2011 implementing Regulation (EC) No 1069/2009 of the European Parliament and of the Council laying down health rules as regards animal by-products and derived products not intended for human consumption and implementing Council Directive 97/78/EC as regards certain samples and items exempt from veterinary checks at the border under that Directive (OJ L 54, 26.2.2011, p. 1). (6) Commission Regulation (EU) 2016/1396 of 18 August 2016 amending certain Annexes to Regulation (No 999/2001 of the European Parliament and of the Council laying down rules for the prevention, control and eradication of certain transmissible spongiform encephalopathies (OJ L 225, 19.8.2016, p. 76). (7) Commission Decision 2007/453/EC of 29 June 2007 establishing the BSE status of Member States or third countries or regions thereof according to their BSE risk (OJ L 172, 30.6.2007, p. 84). (8) Commission Decision 2009/821/EC of 28 September 2009 drawing up a list of approved border inspection posts, laying down certain rules on the inspections carried out by the Commission veterinary experts and laying down the veterinary units in Traces (OJ L 296, 12.11.2009, p. 1). (9) Commission Decision 2004/292/EC of 30 March 2004 on the introduction of the Traces system and amending Decision 92/486/EEC (OJ L 94, 31.3.2004, p. 63). bulk compound feed containing the feed materials listed in (a), (b) and (c). Records detailing the type of products that were transported or stored in a storage plant shall be kept available to the competent authority for a period of at least two years. By way of derogation from point 1, vehicles, containers and storage facilities which have been previously used for the transport or storage of the products listed in that point, may be subsequently used for the transport or storage of feed intended for ruminants provided that they are cleaned beforehand in order to avoid cross-contamination, in accordance with a documented procedure which has been given prior authorisation by the competent authority. Whenever such a procedure is used, a documented record of such use shall be kept available to the competent authority for a period of at least two years. Storage plants storing in accordance with point 2 feed materials and compound feed listed in point 1 shall be authorised by the competent authority based on verification of their compliance with the requirements listed in point 2. Bulk processed animal protein derived from non-ruminants, including processed animal protein derived from farmed insects but excluding fishmeal, and bulk compound feed containing such processed animal protein, shall be transported in vehicles and containers and stored in storage facilities which are not used, respectively, for the transport or storage of feed intended for non-ruminant farmed animals other than aquaculture animals. By way of derogation from point 4, vehicles, containers and storage facilities which have been previously used for the transport or storage of the products referred to in that point may be subsequently used for the transport or storage of feed intended for non-ruminant farmed animals other than aquaculture animals provided that they are cleaned beforehand in order to avoid cross-contamination, in accordance with a documented procedure which has been given prior authorisation by the competent authority. The words “non-ruminant blood products — shall not be used in feed for ruminants” shall be clearly indicated on the accompanying commercial document or health certificate referred to in Article 21(2) of Regulation (EC) No 1069/2009, as appropriate, as well as on the label of blood products derived from non-ruminants. other establishments than those referred to in (i) or (ii) which do not handle ruminant products and which are registered by the competent authority as not handling ruminant products. By way of derogation from that specific condition, the competent authority may authorise the slaughter of ruminants in a slaughterhouse producing non-ruminant animal by-products intended for the production of processed animal protein referred to in this Section, and the handling of ruminant products in a cutting plant or another establishment producing non-ruminant animal by-products intended for the production of processed animal protein referred to in this Section. That authorisation may be granted only where the competent authority is satisfied, following an on-site inspection, of the effectiveness of measures aimed to prevent cross-contamination between ruminant and non-ruminant by-products. the compound feed containing processed animal protein referred to in this Section used in their production contains less than 50 % crude protein. 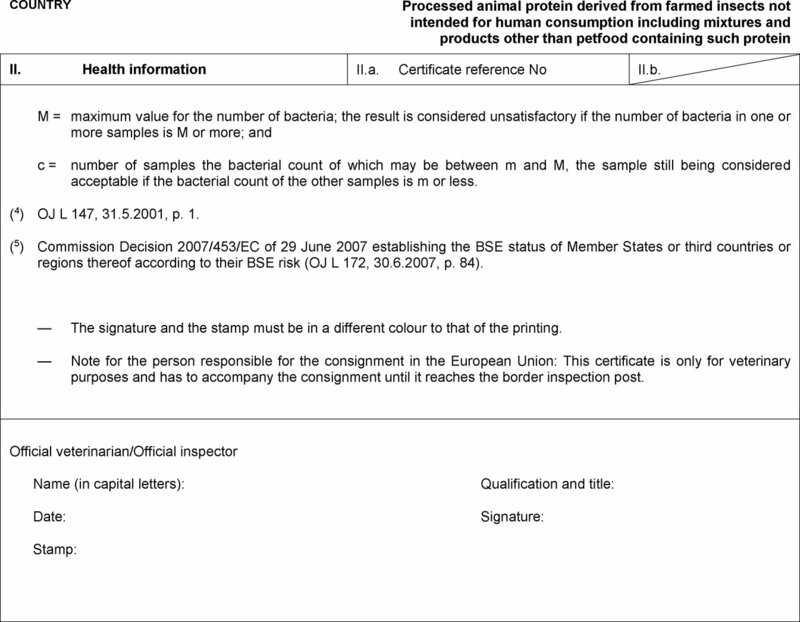 The accompanying commercial document or health certificate referred to in Article 21(2) of Regulation (EC) No 1069/2009, as appropriate, of processed animal protein referred to in this Section and the label thereof shall be clearly marked with the following words: “non-ruminant processed animal protein — shall not be used in feed for farmed animals except aquaculture and fur animals”. milk replacers containing fishmeal intended for unweaned farmed animals of the ruminant species shall be produced in establishments which do not produce other compound feed for ruminants and which are authorised for this purpose by the competent authority. bulk milk replacers containing fishmeal intended for unweaned farmed animals of the ruminant species shall be transported in vehicles and containers and stored in storage facilities which are not used, respectively for the transport or storage of other feed intended for ruminants. be produced in accordance with the requirements laid down in Section 1 of Chapter II of Annex X to Regulation (EU) No 142/2011. Compound feed containing processed animal protein derived from farmed insects must be produced in establishments authorised for that purpose by the competent authority and which are dedicated exclusively to the production of feed for aquaculture animals. the compound feed containing processed animal protein derived from farmed insects used in their production contains less than 50 % crude protein. The accompanying commercial document or health certificate referred to in Article 21(2) of Regulation (EC) No 1069/2009, as appropriate, of processed animal protein derived from farmed insects and the label thereof shall be clearly marked with the following words: “processed insect protein — shall not be used in feed for farmed animals except aquaculture and fur animals”. storage plants authorised in accordance with point 3 of Section A of Chapter III or in accordance with the third paragraph of point 3(d) of Section E of Chapter V.
Member States shall keep up-to-date lists of home compounders registered in accordance with point 3 of Section B of Chapter III, point (d)(ii) of Section D of Chapter IV, and point (b)(ii) of Section F of Chapter IV. rendered fat from ruminants with a maximum level of insoluble impurities of 0,15 % in weight and derivatives made from such fat. By way of derogation from point 1, vehicles, containers and storage facilities which have been previously used for the transport or storage of bulk feed materials and bulk compound feed listed in that point, may be used for the transport or storage of feedingstuffs intended for farmed animals other than fur animals provided that they have been cleaned beforehand in order to avoid cross-contamination in accordance with a documented procedure which has been given prior authorisation by the competent authority. Whenever such a procedure is used, a documented record of this use shall be kept available to the competent authority for a period of at least two years. The processed animal protein shall be transported in sealed containers, directly from the processing plant of production to the point of exit from the Union territory, which shall be a border inspection post listed in Annex I to Commission Decision 2009/821/EC (*1). Before leaving the Union territory, the operator responsible for arranging the transport of the processed animal protein shall inform the competent authority at that border inspection post of the arrival of the consignment at the point of exit. 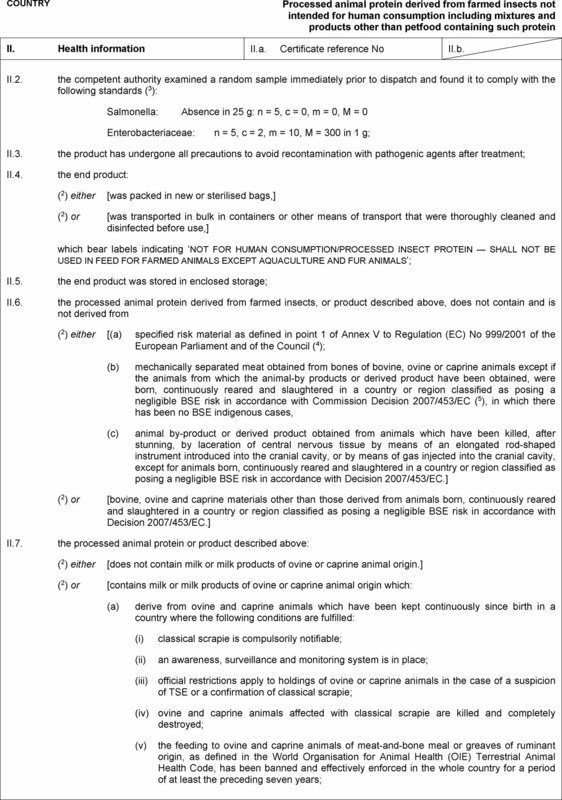 The consignment shall be accompanied by a duly completed commercial document produced according to the model set out in point 6 of Chapter III of Annex VIII to Regulation (EU) No 142/2011 and issued from the integrated computerised veterinary system (TRACES) introduced by Commission Decision 2004/292/EC (*2). 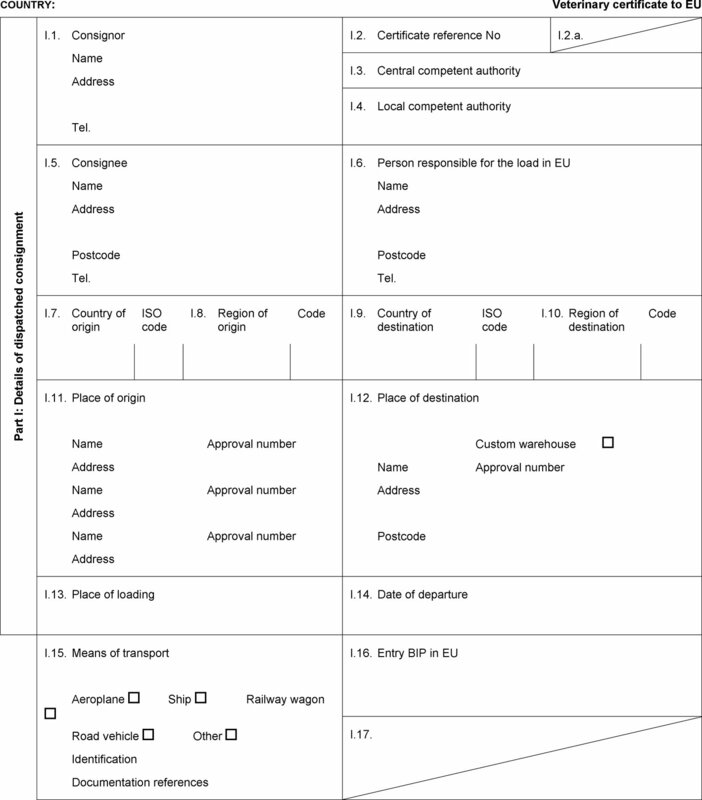 On that commercial document, the border inspection post of exit must be indicated as exit point in box I.28. When the consignment arrives at the point of exit, the competent authority at the border inspection post shall verify the seal of each of the containers presented at the border inspection post. By way of derogation, based on an analysis of the risk, the competent authority at the border inspection post may decide to verify the seal of the container on a random basis. If the seal verification is not satisfactory, the consignment must either be destroyed or must be re-dispatched to the establishment of origin. The competent authority at the border inspection post shall inform, via TRACES, the competent authority responsible for the establishment of origin of the arrival of the consignment at the point of exit and, where applicable, of the outcome of the verification of the seal and of any corrective action taken. The competent authority responsible for the establishment of origin shall carry out regular official controls to verify the correct implementation of points (a) and (b) and to verify that, for each consignment of processed animal protein of ruminant origin intended for export, the confirmation of the control carried out at the exit point was received from the competent authority of the border inspection post, through TRACES. Without prejudice to point 1, the export of products containing processed animal protein derived from ruminants shall be prohibited. is packaged and labelled in accordance with Union legislation. The processed animal protein derived from non-ruminants shall be produced in processing plants which fulfil the requirements of point (c) of Section D of Chapter IV. are dedicated exclusively to the production of compound feed for export from the Union and to the production of compound feed for aquaculture animals to be placed on the market in the Union, and authorised for that purpose by the competent authority. The compound feed containing processed animal protein derived from non-ruminants shall be packaged and labelled in accordance with Union legislation or with the legal requirements of the importing country. Where the compound feed containing processed animal protein derived from non-ruminants is not labelled in accordance with Union legislation, the following words shall be indicated on the labelling: ‘contains non-ruminant processed animal protein’. Bulk processed animal protein derived from non-ruminants and bulk compound feed containing such protein, and intended for export from the Union, shall be transported in vehicles and containers and stored in storage facilities which are not used, respectively, for the transport or storage of feed for placing on market and intended for feeding to ruminants or non-ruminant farmed animals other than aquaculture animals. Records detailing the type of products that were transported or stored shall be kept available to the competent authority for a period of at least two years. By way of derogation from the first paragraph, vehicles, containers and storage facilities which have been previously used for the transport or storage of bulk processed animal protein derived from non-ruminants and bulk compound feed containing such protein, and intended for export from the Union, may be subsequently used for the transport or storage of feed for placing on the market and intended for feeding to ruminants or non-ruminant farmed animals other than aquaculture animals, provided that they are cleaned beforehand in order to avoid cross-contamination, in accordance with a documented procedure which has been given prior authorisation by the competent authority. Whenever such a procedure is used, a documented record of such use shall be kept available to the competent authority for a period of at least two years. Storage plants storing bulk processed animal protein derived from non-ruminants and bulk compound feed containing such protein under the conditions set out in the second paragraph of point (d) shall be authorised by the competent authority based on verification of their compliance with the requirements listed in that paragraph. 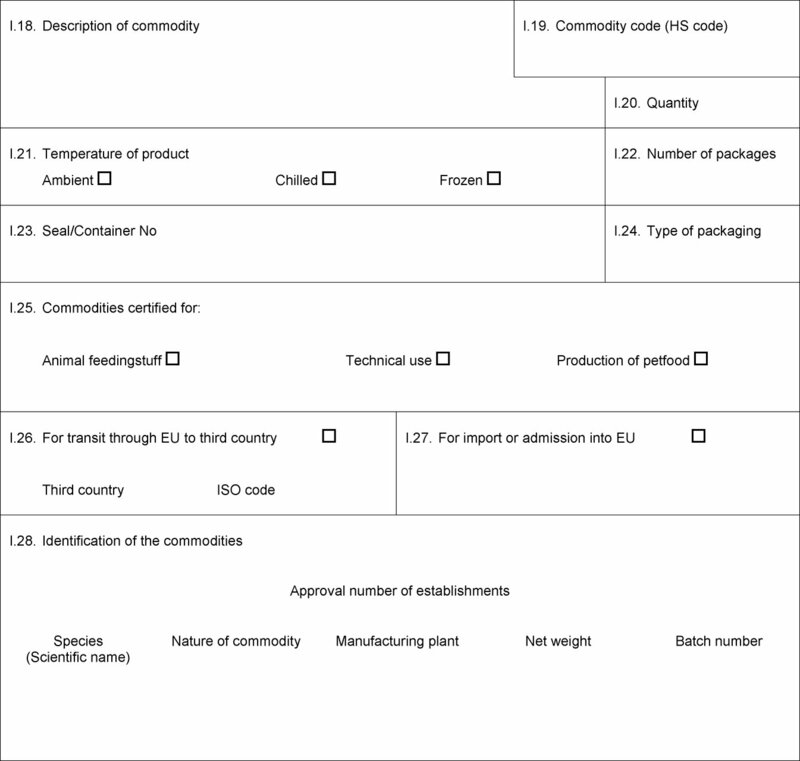 processed animal protein derived from non-ruminants destined for the manufacturing of petfood or of organic fertilisers and soil improvers in the third country of destination, provided that, before export, the exporter ensures that each consignment of processed animal protein is analysed in accordance with the method of analysis set out in point 2.2 of Annex VI to Regulation (EC) No 152/2009 in order to verify the absence of constituents of ruminant origin. (*1) Commission Decision 2009/821/EC of 28 September 2009 drawing up a list of approved border inspection posts, laying down certain rules on the inspections carried out by the Commission veterinary experts and laying down the veterinary units in Traces (OJ L 296, 12.11.2009, p. 1)." (*2) Commission Decision 2004/292/EC of 30 March 2004 on the introduction of the Traces system and amending Decision 92/486/EEC (OJ L 94, 31.3.2004, p. 63).’"
Only animal by-products which are Category 3 material or products which are derived from such animal by-products, other than the Category 3 materials referred to in Article 10(n), (o) and (p) of Regulation (EC) No 1069/2009, may be used for the production of processed animal protein. Category 3 materials referred to in Article 10(a), (b), (d), (e), (f), (h), (i), (j), (k), (l) and (m). the processed animal protein shall comply with the additional requirements set out in Section 2 of this Chapter. Third countries listed in Part 1 of Annex II to Regulation (EU) No 206/2010. Third countries listed in Annex II to Decision 2006/766/EC. (e) the substrate for the feeding of insects and the insects or their larvae have not been in contact with any other materials of animal origin than those mentioned in point (d) and the substrate did not contain manure, catering waste or other waste. — Box reference I.6: Person responsible for the consignment in the European Union: this box is to be filled in only if it is a certificate for a transit commodity; it may be filled in if the certificate is for an import commodity. — Box reference I.12: Place of destination: this box is to be filled in only if it is a certificate for a transit commodity. The products in transit can only be stored in free zones, free warehouses and custom warehouses. — Box reference I.15: Registration number (railway wagons or container and lorries), flight number (aircraft) or name (ship); information is to be provided in the event of unloading and reloading. — Box reference I.19: use the appropriate HS code: 05.05; 05.06; 05.07; 05.11 or 23.01. — Box reference I.25: technical use: any use other than for animal consumption. — Box reference I.26 and I.27: fill in according to whether it is a transit or an import certificate. — Box reference I.28: Species: insects, specify its scientific name. (1a) OJ L 300, 14.11.2009, p. 1. (1b) OJ L 54, 26.2.2011, p. 1. (4) OJ L 147, 31.5.2001, p. 1. (5) Commission Decision 2007/453/EC of 29 June 2007 establishing the BSE status of Member States or third countries or regions thereof according to their BSE risk (OJ L 172, 30.6.2007, p. 84). — The signature and the stamp must be in a different colour to that of the printing. — Note for the person responsible for the consignment in the European Union: This certificate is only for veterinary purposes and has to accompany the consignment until it reaches the border inspection post.